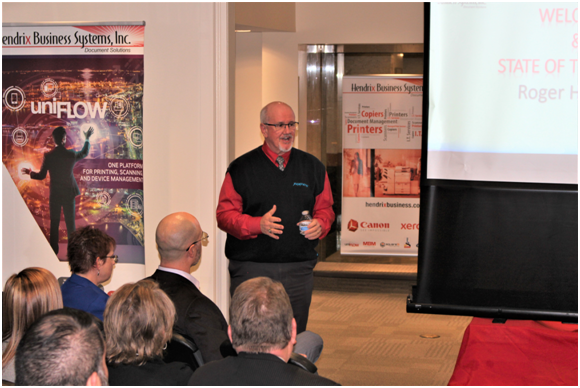 Hendrix Business Systems Hosts Annual Sales Kickoff | Industry Analysts, Inc.
January 17th, 2019 Charlotte, NC – Hendrix Business Systems hosted their annual Sales Kickoff 2019 Meeting in their flagship showroom and technical center at Founders Hall, located in the center of Charlotte. This meeting celebrated Hendrix’s 6th consecutive year of double-digit growth, mainly due to an increased focus on production equipment sales. 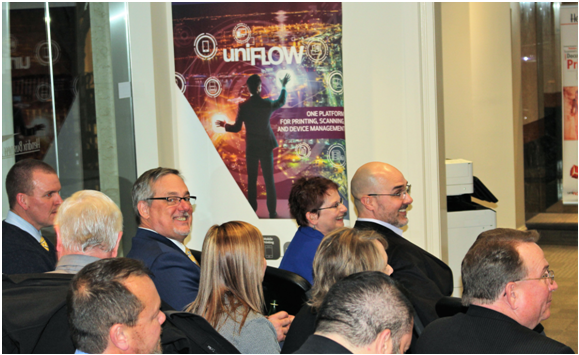 Additionally, each department manager gave a presentation highlighting their team’s own particular triumphs in the company’s astounding 2018 campaign, which broke company records in both the Sales and the Service departments. In attendance were the entire sales team from all four locations, as well as support members who played key roles in the past year’s success. After the formal presentation, the group was treated to a fantastic meal at the chic Essex Bar and Bistro, located just a block away from Founders Hall. Overall, the night was a well-deserved celebration for one great year and an inspiring beginning for the next. This entry was posted in Canon and tagged Hendrix Business Systems by IA Staff. Bookmark the permalink. ← Previous Previous post: Hiring in Pompano Beach, Florida!